If you have the book in your hand, you may notice a QR code on the back cover on the bottom left hand side of the book. You can scan that code using your smartphone and an app called a QR Code Reader. There are many different readers in the app stores so just search for QR Code and pick a free one. We like Paperlinks or i-Nigma and there’s a new one from Kaywa (the site that generated the QR code below). Download the free QR Code reader then launch the app and point your smartphone camera at the QR code on the back of our book. You can try it out now with the QR code below straight off your computer screen! Hold it steady. There! The code above should take you to our book listing on Amazon.com. Nifty, don’t you think? 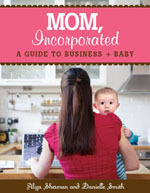 The QR code on our book will lead you to a video where we talk about Mom, Incorporated. There are also some downloadable worksheets from the book available below the video.